Pat Auclair (left) and Adam Pearson. The air is quiet on this blue-sky and sunny Saturday morning, filled only with the faint buzz of an electrical generator locked behind a chain-link fence. Ninety-two Bolt Street is the dead-last spot on a dead-end. Rolling up to a beaten parking lot marred with faded yellow lines, spider web cracks and a handful of dated sedans, the brick factory building it surrounds seems lonely and abandoned. A solemn forklift guards two battered, rusted metal entryways. One reads: LEAVE DOOR CLOSED. The other has no sign at all. Some may see the perfect place to hide a body. But for Merrimack Ales owner Adam Pearson, there was only potential. Inside the seemingly sketchy industrial setting, Merrimack Ales has been quietly brewing some of the finest beers in the Merrimack Valley. And they are almost ready for you to taste. The Lowell microbrewery is aiming for an August opening. “That would hit with a thud, so we’ve been a bit quiet,” he says. Pearson followed the advice of another Lowell brewery: Navigation Brewing Company, which sits less than a mile down the road from Merrimack. Navigation took a conservative approach to brewing output. When they launched, they had plenty of beer to meet demand. Pearson hopes to follow Navigation’s lead. Navigation’s own PJ Mercier also introduced Pearson to Pat Auclair, who would become Merrimack’s brewmaster. Auclair formerly served as brewer at Lowell’s Do Can Brewery, which sadly closed earlier this year following the death of beloved founder, Patrick Slattery. “After Do Can shut down, PJ was like, ‘go to Merrimack Ales. Go to Merrimack Ales. Tell him you know how to do stuff,” Auclair says. After their meeting, Pearson gave Auclair some homework, tasking him with crafting a recipe for a new honey witbier. Auclair passed with flying colors. “We were scary close on how we figure and approach designing our beers,” Pearson says, adding that they also had similar grasps on what beers worked commercially, what’s out there in the homebrew world, and what ideas they thought would work but didn’t. “Once you gather all that, it then becomes about what ingredients are needed to make the beer you want to make,” Pearson says. And make beer they will. Merrimack Ales expects to have at least a few different beers available at its anticipated August launch, including a rye IPA brewed with five kinds of hops, a witbier made with local honey sourced from Merrimack Valley Apiaries in Billerica, and an altbier. Altbier, a light-bodied, malt-forward, mildly hopped German-style copper ale, is underrepresented in the craft beer market. Pearson and Auclair thought it would make for the perfect flagship ale. “It’s approachable. We haven’t gone too extreme in one direction or the other. That’s on purpose,” Pearson said. Other future ale offerings include a chocolate oatmeal stout, blackberry wheat ale, and a maple cream porter. But at the beginning, Merrimack is putting focus on its flagship altbier ale. “It’s just a nice, easy drinking beer that will let people get to know us,” Pearson said. Pearson’s background is in ceramic engineering. After spending a dozen years working in aerospace and automotive technology, and then another 15 years in banking and consulting, he longed for a more creative outlet. “As an engineer working in a bank, the most technical thing I operated was a mouse,” Pearson said. But after giving his parents a hard time about what he wanted for Christmas one year, things began to fall into place. “I said go ahead and get me a home brew kit,” Pearson explains. “Now I’ve been doing it for over 10 years. But it was honestly just because I just needed something to tinker and play with.” Auclair fell into brewing in a similarly unpredictable way. From there, Auclair and his friends took a Mr. Beer homebrew kit and got to work. He continued brewing with friends throughout the rest of college. After graduation, Auclair met Do Can founder Pat Slattery, who got Auclair hooked on the beer business. In addition to the planned year-round releases, there are also plans for limited beer releases, called the Hypothesis Series. “I figured if a plate of turkey didn’t set you down, this definitely will,” he says. Other entries in the Hypothesis Series include a Russian Imperial Stout and a Double IPA. There are also plans for a Halloween beer. 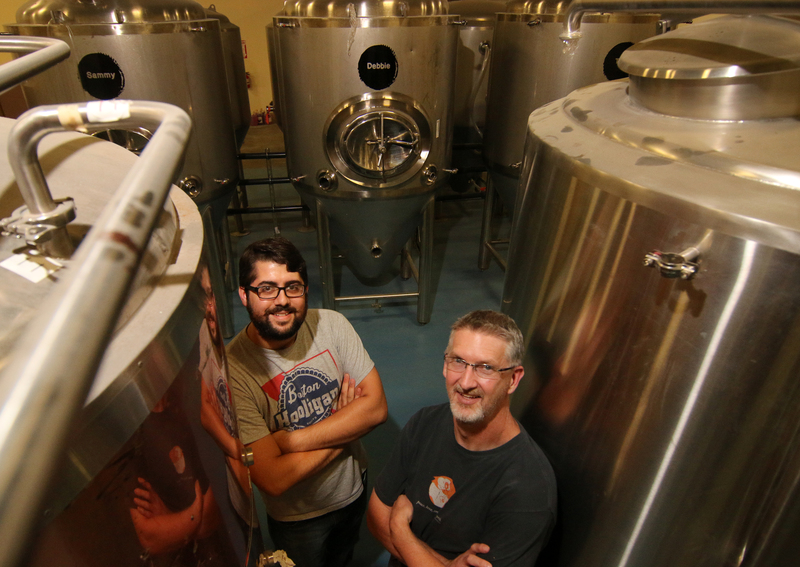 The two-man crew of Merrimack Ales expects to produce an annual 1,500 barrels of beer once they’re up and running. Plans are to begin retail distribution sometime in August. Hours are yet to be determined, but they aim to offer growler fills and bottle sales at the brewery during a couple evenings each week. They also hope to soon distribute 22-ounce bomber bottles to local package stores in Lowell and surrounding towns. Sample Merrimack Ales craft beer at the annual Blues N Brews Festival noon-7pm on Saturday, Aug. 22 at the Nashoba Valley Ski Area, 79 Powers Rd., Westford. For more information about Merrimack Ales, visit merrimackales.com.